Life is full of places to go to, people to meet and a number of things to be done every day. Hard work and discipline is the only way to get through with a tight schedule like that. But in the process, it is also important to take good care of your body and mind. The best way to ensure that you don’t lose control of your life is by making a conscious effort to inculcate some good habits, beginning right from the very first moment you wake up in the morning. Here are 10 things that will make a big difference if you remember to do them every morning without fail. Though this might seem almost like a natural bodily function that need not be mentioned, I believe that it must. It is extremely important to take a few minutes as soon as you wake up, to just inhale and exhale deeply; focusing on the amazing ability of your body to be able to retain goodness and expel all that isn’t beneficial to its well-being. Maybe this is something our mind needs to learn from our bodies. If we absorb only the goodness and filter out the negativity in our surroundings, life will definitely be a lot happier than it would be otherwise. Another thing we often fail to do is to count our blessings. Busy as we are, we tend to spend time fretting over things that don’t go as per plan, but conveniently forget to notice all that did go right and all that continues to work out well for us. Being able to wake up in the morning should remind you that you’ve been blessed. To be able to see a new day, to live to be productive and grow through its experiences, is a gift in itself. Take a moment, and be grateful for just that. You’ll begin to see things a lot more differently for the rest of the day. It is very convenient to wake up and just walk away from your bed without looking back at it. But making your bed is not just a household chore. It is also a discipline that will teach you a lot in its own little way. Making your own bed and settling your room in the morning will give you a feeling of achievement and inner satisfaction that will make you feel like you can do anything that you put your mind to in the day that lies ahead of you. And such a belief can lead to nothing less than success. Armed with self belief and confidence, you need to now actually become aware of what is lined up for you to do through the day. Though actually writing it down and looking at it would be ideal, you could also just make a mental list, so long as you don’t miss out anything. Doing this at the start of your day is not just a formality, but it will actually help you get perspective and be real about you capabilities and set targets accordingly. Once you have that in place, you can be sure that you’re not too far from achieving it all. Your body has worked hard all night to digest your dinner from the previous day. You need to, as the word suggests, “break” the “fast” and give your body some real nutrition; so that it can fuel your numerous activities lined up for the day. Having heavy breakfast will keep you powered up and energetic throughout the day, and will ensure that your body and mind are both healthy and happy. So, no matter what happens, don’t skip your breakfast. It is truly the most important meal of the day. Exercising is generally understood to be physically tedious, and highly disciplined in nature; which is why, many don’t even like the sound of that word! However, it is important to understand that there are many forms of exercise. Going to the gym or going for a run is just one type, with other options like dance and yoga available for others who have a more creative perspective. What matters is that every part of your body is put into action, bringing vitality to the body, and happiness to the mind. That, in reality is good, wholesome exercise. After exercising, it is important to wash off the sweat and relax your muscles. Having a bath with warm water will help you do just that, and give your day a power start, as it refreshes and re-energizes you. Besides, you are more likely to have happy thoughts during a morning shower, as you haven’t yet been burdened with the happenings of the day, and these happy thoughts will lay the seed for a happy and positive day. So whether you’ve bathed the previous night or not, you should step into the shower. It will definitely mold you to be fresh and active. After you’ve bathed and dressed up for the day, it is usually a natural thing to take a peek in the mirror before you leave the house. However, spending a little more time there may just make a big difference. Take the time to look in the mirror, appreciate both good as well as not so good things in yourself, and remind yourself that you can do whatever you decide to because you deserve happiness and success in life. Though this may seem like small and simple thing to do, you will find it tough to do initially, as we are used to criticizing more than we motivate ourselves. But making this a habit will definitely help you grow into a confident and responsible person; because what you say is what you will believe, and what you believe becomes who you are. So say the right things to yourself in these few mirror moments, and you will have done yourself a big favor. Whether you’ve got to get to school, work, a meeting or an appointment in the morning, set out early. If you are always running late, it will stress you out, and make things very frustrating. So, wake up early if you need to, but don’t risk reaching late to your morning commitment. It may cost you your peace of mind for the rest of the day. Though this sounds like a school kid’s routine, it actually amounts to a lot more than just that. Even if you don’t feel too happy on a particular morning, try to smile and wish someone else a little happiness for the day. You will not only improve their mood, but their resulting happiness will surely lift your spirits too! If you make it a point to keep these 10 things in mind and make them regular morning habits, you will notice that life is not as stressful as it seems, even if you have the busiest schedule possible. It’s not that tough. And if you keep doing them, you will soon be on your way to a healthier, happier and more productive way of life! 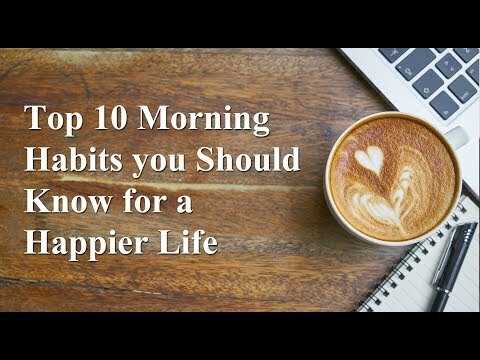 The habits that you hold every morning have a chance to break or make your day, here are the WeBeingFit suggested top 10 morning habits that can help you live a happier life.